In 1806, the Rev. David Thurston was called as minister of the Church and served until October 15, 1851, during which time he was one of the leading Ministers in the territory. He established what is believed to be the first Sabbath School in New England in 1808, and took an active part in the politics of the Church and State throughout New England. He was a leader of the Temperance and Anti-slavery movements, the latter being the eventual cause of his dismissal since it caused a "division" among the people of the Parish. He was affectionately known as "Father Thurston," and a tablet to his memory still adorns the rear wall of the Church Sanctuary. 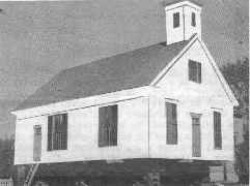 In 1824, work was started on a third meeting house, for the first time called a church, and it was dedicated on August 10, 1825. This building still stands on upper Main Street, having been converted into apartments after the Church moved to its present location in 1904. In 1860, a vestry was built in the center of town at a cost of $1200, This was for many years used for the Sunday evening and mid-week services of the Church, as well as for its social events. In 1904 this vestry was raised and fitted with stained glass memorial windows. 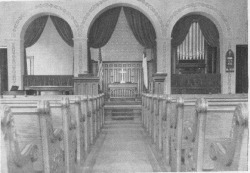 On Sunday, April 5, 1905, it was dedicated as the new Sanctuary of the Church at appropriate services conducted by the Rev. A. K. Baldwin. Mr. Baldwin was also ordained into the Christian Ministry on the same day, only to resign as the Church's pastor four days later to accept a larger pastorate. This building, in which the Church still worships, is the fourth that it has occupied during its 171 years. Its interior was completely remodeled and redecorated in 1945 at a cost of $3400, the design being the creation of Mr. Harry Cochrane, noted Church architect from the neighboring town of Monmouth. Many memorial gifts, recorded elsewhere in this manual, have added immeasurably to the beauty of the Sanctuary through the years. The Church celebrated its 100th Anniversary on Monday, Sept. 4, 1876, with services in the Church at two o'clock in the afternoon under the leader-ship of the Pastor, the Rev. Warren F. Bickford. A festival was held in the evening at the Vestry. The 150th Anniversary was celebrated in conjunction with Old Home Week in the summer of 1926. Mrs. Murray Stanley was general chairman of the Town Celebration, and the Rev. C. F. Sargent, the Pastor of the Church, delivered the Historical Address at the morning service on August 8. When the redecoration was completed in 1945, the Church was rededicated at a service held on Sunday, November 18, at 430 in the afternoon. The Rev. Harry Trust, a former pastor of the Church (l914-1918), and President of the Bangor Theological Seminary, delivered the sermon. The Pastor, John H. Alexander, led the people in the Litany of Rededication; and the pastors of sister Churches in the Community participated in the service. 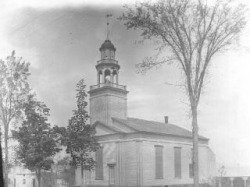 On March 18, 1895, the Church voted to become incorporated under the laws of the State of Maine. Since its organization in 1776, there have been four major revisions of the Church's Constitution, By-Laws, and Statement of Faith and Covenant. Each of these has been made in an effort to keep the Church in accord with the times and in conformity to the practice of the Congregational Churches throughout the land. The first of these changes was made in 1826, the second in 1875, the third in 1895, and the most recent on March 7, 1947. Each of these changes has been recorded in a special booklet, of which this manual is the most recent. To the date of the publication of this Manual, April 18th 1945, the Church has had 910 Members officially unite with the Church. At the present time  there are 123 Members, of whom 82 are residents of Winthrop. There are 42 men and 81 women. At the present time , the Church is organized according to the Constitution and By-Laws printed in this Manual, In addition it has a Church School with an enrollment of 90 and an average attendance of 65. There is also a very strong Ladies Social Circle, which has through the years been one of the major mainstays of the Church, contributing loyally to its financial support. There are three youth organizations: the Junior High Boys Club for boys over 10 years of age; the Pilgrim Fellowship for High School young people; and the Phi Theta Epsilon Sorority for girls 10 to 14. The Church also co-operates with other churches in providing weekday moral instruction in the public schools as authorized by the laws of the State. There is in addition a club composed of the young married couples of the Church which meets monthly during the winter months In addition to these, several Girl Scout troops regularly use the Church Vestry, as well as other Community organizations.